Save $300 on buying one air purifier & get 2nd of the same model at 50% off. Hurry up! 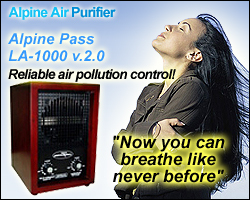 Trade your old air purifier, get additional $100 Off Limited period offer. Alpine Air Purifiers use a proprietary blend of technologies that combines two different types of ionisation along with activated oxygen to purify indoor air: Just Like Nature Does During a Thunderstorm – But Without The Noise! Found a coupon for Alpine Air Technologies ?